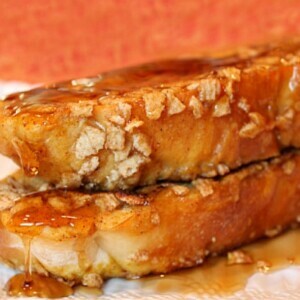 This Pumpkin French Toast is an awesome fall breakfast recipe. The crunchy cinnamon addition to the crust is completely optional, but oh so delicious! In a low-lying, flat bowl, whisk together the eggs, pumpkin, cream, milk, cinnamon, nutmeg and sugar. Put the crushed cereal in another low-lying flat bowl. Heat a skillet to medium-heat, and brush with butter (or spray with nonstick spray). Quickly dip the bread on both sides into the egg mixture, then cover both sides of the bread with the crushed cereal. Place in a hot skillet, reduce heat to low and cover with a lid. Heat 2 to 3 minutes on each side, until lightly browned. Repeat with the remaining bread. *This recipe really is best with French bread that is a day or two old- if it's too soft, it will absorb too much of the liquid and turn out soggy. *Do a quick dip into the liquid. You don't want to soak the bread in it.